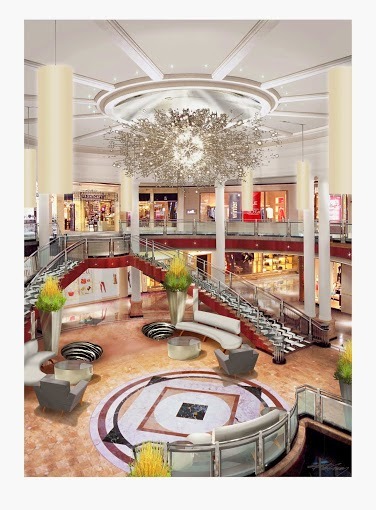 ATLANTA, January 15, 2015 — Phipps Plaza, the Southeast’s top luxury shopping destination located in the heart of Atlanta’s fashionable Buckhead district, is shedding light on an upcoming chandelier removal and installation project as part of its extensive renovation. On Tuesday, January 6, the former grand chandelier which has hung in the mall’s Court of the South since 1992 was removed to make way for a new lighting installation -- a stunning sixteen-feet wide by 7-feet tall chandelier composed of an illuminated core, surrounded by 88 stainless steel spears and featuring over 2,600 acrylic spheres throughout the fixture. Inspired by the chandeliers in New York City’s Metropolitan Opera and the Chicago Waldorf Astoria Hotel, this custom LED lighting enhancement will complement Phipps Plaza’s other recent interior makeovers, providing the property with a fresh new look and feel. Phipps Plaza is offering to gift the grand chandelier to a local philanthropic organization that can use the fixture either in its current space or to generate revenue in upcoming fundraising efforts. The ornate light fixture, which was installed as part of the mall’s renovation in 1992, is valued at $25,000 and hangs 10-feet wide by 12-feet tall. Finished in dark bronze, the elegant, antique chandelier features a dazzling crystal jewel dome that beautifully catches and reflects light. Interested Atlanta-area 501(c)3 non-profit organizations are invited to apply to receive the chandelier by sending relevant background information, contact information and a letter explaining the organization’s desire for the chandelier to Leslie Bland at Phipps Plaza (lbland@simon.com) by February 28, 2015. For more information, please call (404)261-7910. Phipps Plaza will welcome the new, updated chandelier as part of the overall enhancements that are taking place during the mall’s renovation project. These updates included an extensive interior makeover, upgraded energy-efficient LED lighting, new interior colors with warm wood accents and updated railings, comfortable lounging areas with Wi-Fi connectivity and device chargers, upgraded restrooms, and the installation of a hotel-like concierge customer service center. Major improvements to the mall’s parking include new lighting, new flooring and automatic doors to welcome customers. Located in Atlanta’s prestigious Buckhead area, Phipps Plaza is the Southeast’s premier upscale shopping destination, and is a Simon mall. Its diverse and exclusive mix of fashion and luxury retail features signature shops for Gucci, Versace, Jeffrey, Giorgio Armani, Valentino, Hugo Boss and Bally plus Tiffany and Co., and is anchored by Nordstrom, Saks Fifth Avenue and Belk. Phipps Plaza also offers popular dining and entertainment experiences including four white-tablecloth restaurants – Davio’s Northern Italian Steakhouse, The Tavern, Twist, and YEBO Restaurant & Bar – a 14-screen AMC Theatre with luxury recliners in all auditoriums, and LEGOLAND Discovery Center. For a directory of stores and upcoming events, visit simon.com or find us at facebook.com/phippsplazabuckhead, twitter.com/ShopPhippsPlaza, and instagram.com/shopphippsplaza. Simon is a global leader in retail real estate ownership, management and development and a S&P100 company (Simon Property Group, NYSE:SPG). Our industry-leading retail properties and investments across North America, Europe and Asia provide shopping experiences for millions of consumers every day and generate billions in annual retail sales. For more information, visit simon.com.